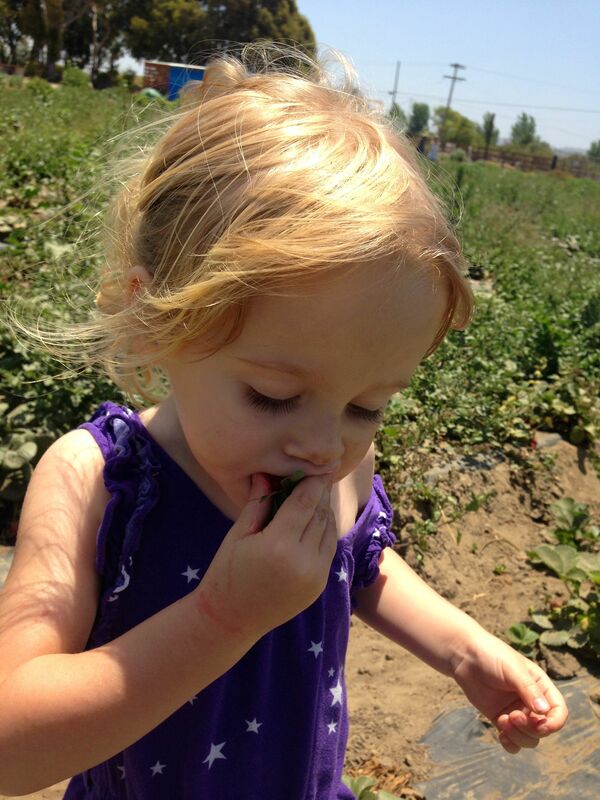 We had so much fun picking strawberries at Suzie’s Farm this spring. So when the opportunity came up for more kid-friendly activities and lunch at the farm, I cleared out my schedule. The little Birds and I joined a small group of bloggers and were treated to a tour and hanging out with Melissa, the director of education at Suzie’s Farm. “Doctor Carrot,” as she is known there, told us all about their summer camps. Ever wonder who the “Suzie” in Suzie’s Farm is? A sweet doggie! Melissa and Abby of Suzie’s Farm told us all about the dog that adopted the founding farmers as they led Little Bird and her new friends in acting like dogs and other animals on the farm. We sang a song about plants, took a tour of the garden and picked leaves for an art project. As the tour was ending, the unmistakable fragrance of strawberries filled the air. Abby told us we could each pick three, and only three, strawberries to eat on the spot. Little Bird and I had no problem finding sweet, beautiful red strawberries. In fact, we kept finding them. I figured she must have meant three strawberries each per person, not per child, right? Soon we fell behind the tour, unable to stop! I felt a bit like Charlie and his grandpa in the Chocolate Factory as we stole a few more sun-warmed strawberries. After the tour we were treated to lunch by the young and talented chefs of Salt & Cleaver. For a sausage restaurant (“sausage” is in their url), they prepared a surprisingly plant based and delicious meal. Highlights for me included Padron peppers with a beet and goat cheese sauce, finished with orange zest; a zucchini based “mac and cheese’ (no noodles but plenty of cheese); and a watermelon and feta salad with house made pickles. The restaurant is in Hillcrest and looks like a fun night out. Next mamas’ night out?? 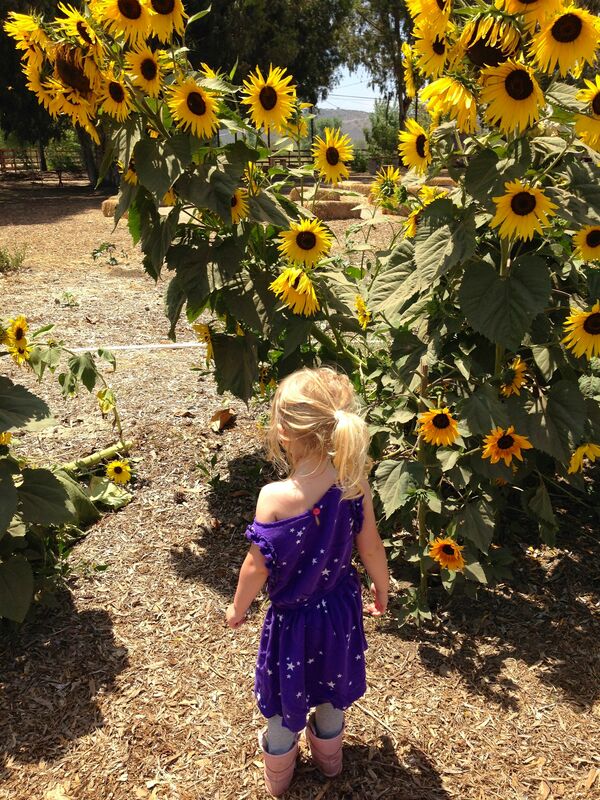 Tour the farm, picking your own veggies as you go. Every Tuesday and Saturday, $10/person and $10/bag of organic veggies. Week long summer camps start June 16th, with options for grades K-5 and grades 5-8. Cost is $285/week with sibling discounts for multiple children. Activities range from learning about farm animals, farm tools, cooking, making art, and survival skills to running a farmer’s market. Can I sign up? My top pick: Coming up in September, the Autumnal Equinox Dinner is a fancy pants, multi-course, wine and dine alfresco affair, catered this year by Whisknladle. Yummmmmm. Tip: tickets sold out last year in July, so buy early! Click on any of the images below to see more of our day. Abby of Suzie’s Farm shows off the tomato plants. Picking kale at Suzie’s Farm. Padron peppers with beet/goat cheese sauce from Salt and Cleaver.